Have You Tried The New Kindle Font, Bookerly? Amazon will probably never satisfy typography enthusiasts but that doesn't mean they're not continually improving the fonts they offer on the Kindle platform. A couple months ago Amazon quietly started rolling out a new font for the Kindle platform. There was no announcement, and the font is still not widely available, but if you read on your Fire tablet then you may have gotten a little pop up telling you that there is a new font choice available. I've been reading with the new font this afternoon, and I'm not sure what to say. Sure, it looks a little nicer, but I was fine with the existing fonts. I never really had a complaint against Amazon's font choices (justification is another matter). I've been in ebooks long enough to know that ebooks used to look much worse than they do now, so when I hear the font purists complaining I simply tune them out and go back to reading. What do you think of the new font? If you haven't had a chance to try Bookerly yet, there is a way for you to install it. The font is not available on my Kindle iPad app nor on the Kindle Android app I checked. And I also have reports that it's not available on E-ink Kindles either. But if you would like to try it, one helpful soul over on XDA Forums extracted the font files and I have them posted as a ZIP file. If you've hacked your kindle, you can sideload the font. 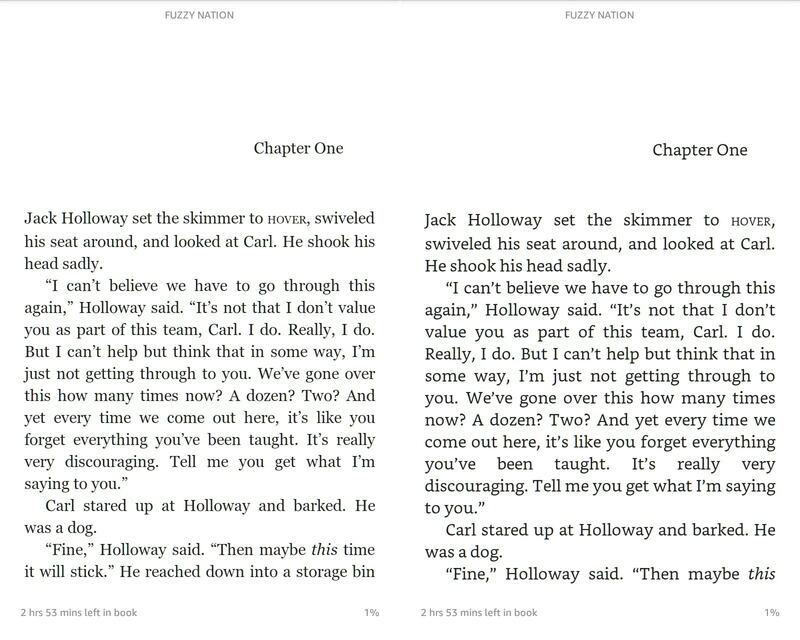 You can also embed the font in an ebook file (Epub or KF8). It works fine in open reading apps like FBreader and Coolreader and it should work in Kobos. The verticals seem just a bit too thin. Hi there, Marcie. My name is Ashley and I work on the Kindle development team at Amazon. I read your comment and have some questions about your experience since you changed your font to Bookerly since font settings should be sticky- once you change them in one Kindle book they should display with these same settings in all books (with some exceptions). Is there some way that I can contact you so I can get some more information about this and figure out if we have a problem that needs fixing? Hi Ashley, Could you please advise me whether it’s possible to choose between fonts in the pop up option, that will feature the story texts in my planned e-books. My designer is planning to upload a dyslexic font as the default option, which I’m hoping can be a choice rather than stand alone. Thank you. I don’t love it. To me, it can’t seem to figure out what it wants to be. It’s marginally readable and the serifs, at first blush, appear to be slab … and if that’s what they were going for they should’ve just stuck with Caecelia. But the more you look at the font as a whole, the more it resembles Baskerville… and if that’s what they were going for they should’ve just made Baskerville the default. Yes, it’s neither a serif nor a san serif. I don’t understand it either. Legal trouble. Fonts have licenses and you can’t use it as you wish. We’re talking multi-million lawsuit here. If Amazon complains, I’ll take it down. But they probably won’t. They let people share device firmware updates, including hacked ones. I still prefer Palatino, thankyouverymuch. Looks like a slab serif font, not impressed. I prefer Georgia on tablets, Palatino on kindles, and Baskerville on paper. I’d never heard that term before. That is what it looks like, yes. I remember a time when authors and publishers put an exorbitant amount of thought into fonts, layout and line spacing. Updike comes to mind and there were many others. Having grown up in a time when learning to block type was part of “shop” in middle school, I’m glad to see some attention spent on it in the digital age. Most modern print books I pick up look horrible. My expectations with e-books is low, but they’ve come a long way. Why are Amazon wasting their time on fonts? I’ll tell you what they need to be working on in two words: hyphen-ation. Default justification without hyphenation is a surefire recipe for ugly. Yep.That would be a nice optional feature to have. There’s a plugin for Calibre called “Hyphenate This!”, but that just increases the size of the ebooks… Having it locally on the device instead, would be preferable. Come on, Amazon! Do eeeet. Opening the font in FontForge reveals that the font has plenty of kerning classes. I do not know whether Kindle Fire honors them or not though. It’s really hard to beat Georgia for screen readability (on non-eink devices, a good slab serif works better on eink, imho).